Do you want to ride your motorcycle with style? If so, we have this uniquely-designed rearview mirror. It has three blue LEDS through mirror with turn signals on each mirror. Also, it emits amber LED color. 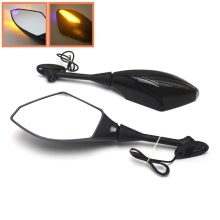 With wide and clear mirror, this side mirror will offer you a clear view, making your riding safer. Eye-catching and beautiful appearance in arrow shape. Glass mirror with built-in LED turn signals, emitting amber light color. Unique and novel design with 3 blue LEDs through mirror with turn signals on each mirror. High toughness and smooth surface, not easy to crack or break. Wide and clear mirror provides clear view. Easy to install, coming with hardware. Adjustable mirror angle (Up & Down, Left & Right, forward & backward). Universal fit for all street bikes including Honda, Kawasaki, Suzuki, Yamaha or roadsters with 4cm~7cm screw hole. Perfect complement to your motorcycle.